Simo manages a tea house near the apartment I rented in Essaouira. He cooked in France for 3 years and we talked a lot about food and spices. 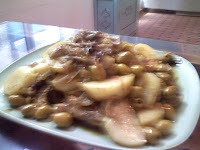 My second day at the tea house, he closed shop for lunch and asked me to join him and Driss for lunch, a chicken tagine with potatoes, olives and onions. Very yummy.